Cooking Turkey or How to Cook a Turkey was written at the request of one of the restaurant guests. He asked that we be as specific as possible. He considers, as many Americans do, a roast turkey to be a true comfort food. Then the two guests he was with asked for an article on How To Carve A Turkey. We have always been “guest driven." Just click the link! If you are roasting a frozen turkey, allow one day for every 4 pounds that your turkey weighs and defrost in the refrigerator. 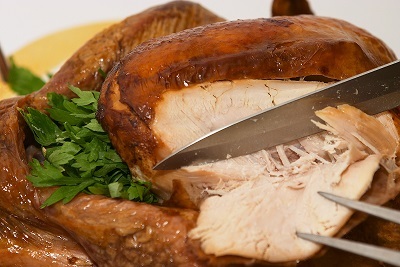 If you are roasting a fresh turkey, do not hold more than two days or past the date on the label. The roasting process will reduce the moisture content of any type of meat, so it is important to follow the steps for roasting to ensure the best results. Potatoes may be peeled, covered with cold water and stored in the refrigerator. Bake pies. Pumpkin pie should be stored in the refrigerator. If possible, set the dinner table. Plan the serving dishes you will use for dinner. Ask your sister (like I do) or a friend to come a little early to help with the final preparations. 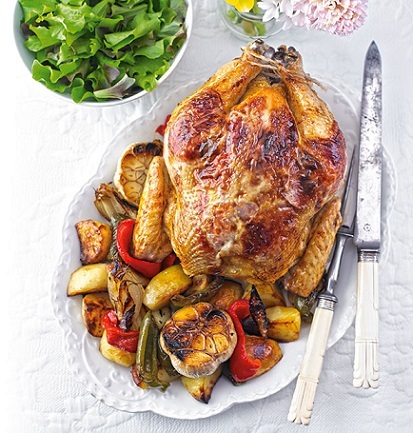 Roasting times may vary greatly depending on a number of variables that affect the cooking time such as the shape of the turkey, the proportion of meat to bone, the variations in different ovens, the altitude, and if the turkey is fresh or frozen and then thawed. Listed below are roasting times that can be used as a general guideline, but the only true gauge for determining proper doneness is with a meat thermometer. The breast must reach an internal temperature of 170° F and the thigh must reach 180° F.
Roasting Times for a Whole Turkey Cooked in a 325° F Conventional Oven Note: Using a convection oven will cut as much as 25% off the cooking times. Read all the directions before you begin cooking turkey preparations. Let the turkey sit out at room temperature for 2 hours before putting it in the oven. I prefer to bake the dressing separately instead of stuffing the turkey because it cooks more quickly and there is no time consumed removing dressing from the turkey. These directions address both options. If you are going to stuff the turkey, do it right before the bird is placed in the oven. 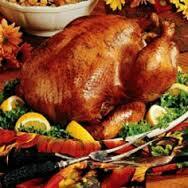 Do not stuff the bird early as harmful bacteria may grow if the turkey is not cooked right after stuffing. 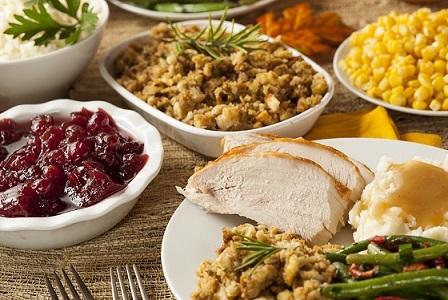 Don't pack the stuffing tightly because it expands as it cooks. If you are baking the dressing separately, prepare it shortly before baking by spooning lightly into low, greased baking pans. Brush the cooking turkey with melted butter to help the browning process. Roast uncovered. Keep the oven door closed as much as possible to keep a constant temperature in the oven. Reserve the broth and the giblets for gravy. If you do not want to add the giblets to the gravy or dressing, just discard them. Baste the turkey with drippings (fat only) every 30-45 minutes for a crisp skin. 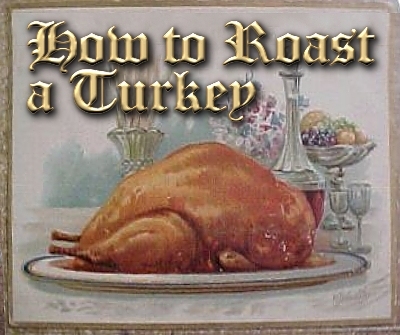 You may tent the turkey with foil towards the end of the roasting time to keep it from browning too much. 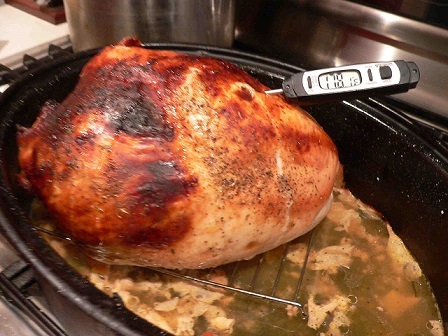 Use a meat thermometer when cooking turkey to find out the temperature (remove at 165 degrees F for the breast and 175 degrees F for the thigh). The temperature will rise about 5 degrees as the turkey sits. Do not overcook. 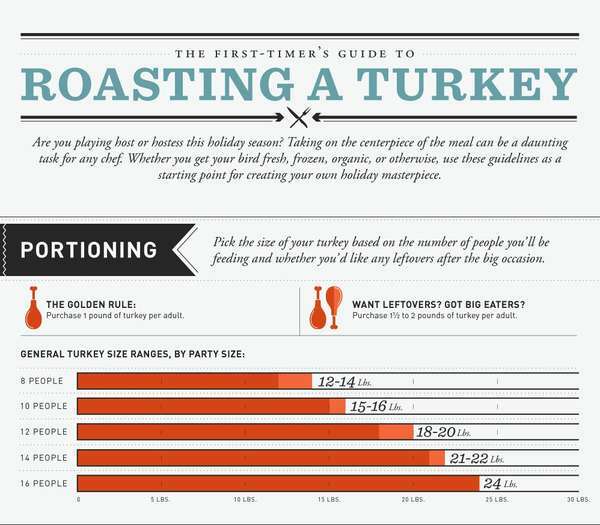 The total roasting time depends on the size of your turkey (see chart). 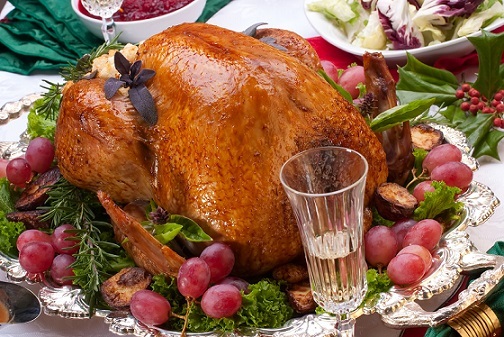 You can use lifting forks to remove the turkey from the oven and place it on a large cutting board and tent it with foil. Let it sit in a warm place about 20-30 minutes. This distributes the juices and makes carving easier. Place the lifting forks as shown in the photo for minimum loss of juices. Drain drippings from the pan into a large measuring cup or bowl. The fat will rise to the top. Spoon the fat into a measuring cup and save for the gravy. Pour 1 quart of chicken stock into roasting pan over medium heat and stir to loosen brown bits in the pan. When all the brown bits are loosened, pour into a large pan with the rest of the chicken stock and the giblet broth enough to equal 3 quarts. Bring to a simmer. Make a roux by placing 6 ounces of reserved fat (from the roasting pan) in a sauce pan over medium heat. Add 1 1/2 cups of flour and stir using a wire whip until the mixture is smooth. Brown lightly but do not burn. Beat the roux into the saucepan of stock to thicken it. The oven-roasting bag keeps the turkey very moist and it speeds up the roasting time. The following cooking times can be used as a guideline for an unstuffed turkey roasted in an oven bag in a 350° F conventional oven. An additional 30 minutes or more may be required for a stuffed turkey. Remember, the only reliable gauge for determining proper doneness when cooking turkey is with a meat thermometer - the breast must reach an internal temperature of 170° F and the thigh must reach 180° F.
Yes, cooking turkey takes a little work. I think that is why the restaurant is busy on Thanksgiving. But if you follow the directions carefully and are reasonably organized, you'll do great. Enjoy cooking turkey with your friends and family. Enjoy this comfort food and the company of those you share it with! "No more turkey, but I'd like another helping of that bread he ate."